Got just a couple more dialogue portraits to share after all! And I’m facing some tough situations involving my house. Without going into details, the expenses could be a little more than enough to force my hand on the job offer, but nothing is certain until tomorrow. Suffice it to say that both good and bad events have made this a slightly overwhelming time for me! But are you interested in that? Well, even if you are, I don’t think a 3000-word post would be beneficial nor can I afford to put that many resources into such a post with everything I’m trying to juggle. So here are some pretty pictures instead! Here’s Alex’s pixel art of Leaf, the Dreamblazers name-dropper! These are blown up to triple size for visibility’s sake. 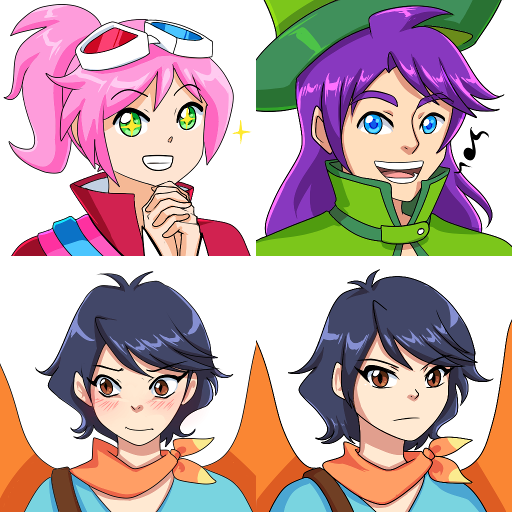 We considered three possible sizes for character sprites, but I took a quick poll of just a few carefully selected people (Flora because she’s an artist who doesn’t game much, another friend who games a lot but isn’t an artist, a third friend who games and is an artist, and of course Alex as the pixel artist got input) and this size ended up winning. Shown here are all of Leaf’s sprites except for identical versions that don’t wear her sword, but for future characters I won’t necessarily be able to show all sprites for spoiler reasons, just like I hid some dialogue portraits. =) More characters coming in the following weeks! This entry was posted in Devlogs, Dreamblazers on May 18, 2015 by JellyPaladin.